Yep, Zalman's done it again. Continuing their mission to offer the true gaming enthusiast the highest standards of online PC warfare, Zalman has upped the ante of precision mouse modulation and developed the MP1000 Gaming Mouse Pad. The MP1000 is a sleekly designed pad that features a proprietary eco-friendly coating to deliver superior mouse response, offering both fast and fine sliding. Tough against abrasion, this Zalman gaming mouse is sure to have an insanely long lifespan, and also offers a large, anti-slip rubber base to ensure the mouse goes where YOU want it go. 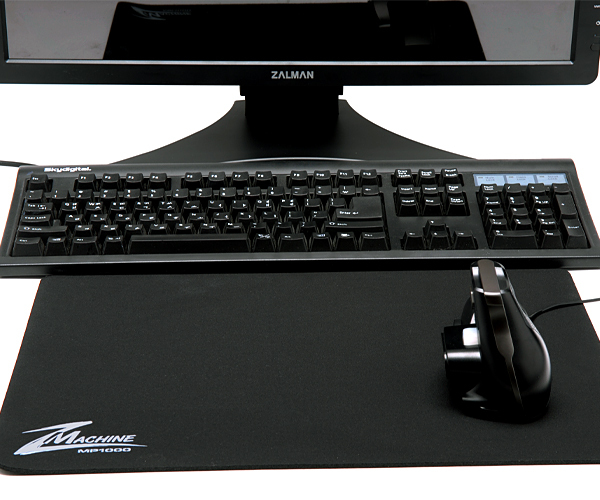 In addition, this Zalman mouse pad looks damn good to boot, with materials made from a high density Poly Jersey that allow for a slick and ultra-smooth finish. All in all, it's the perfect accessory to take into battle with the Zalman FPS Gun Gaming Mouse*. *Zalman FPS Gun Gaming Mouse Not Included.